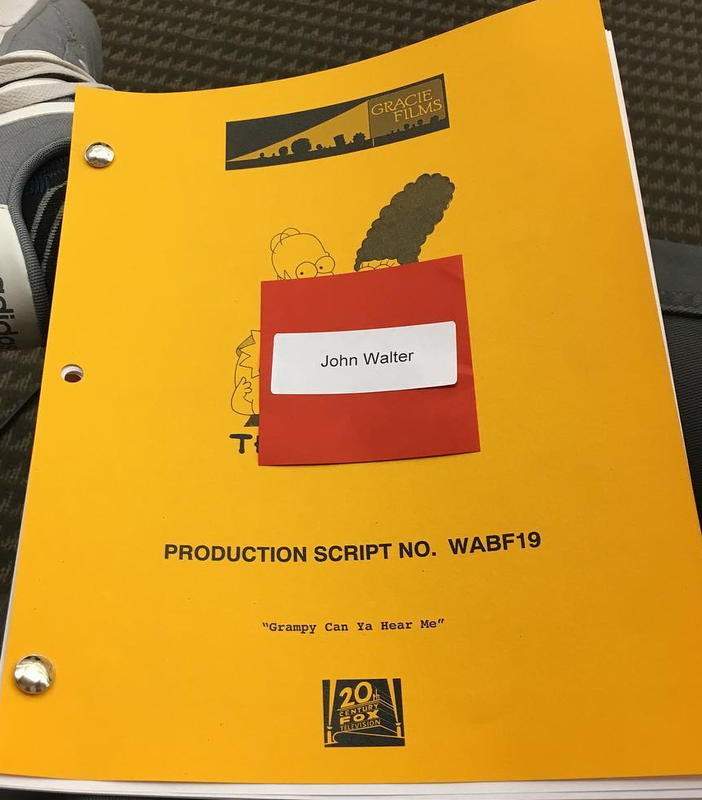 The Simpsons’ Season 29 continues, as this Sunday, November 5th, 2017, Fox aired “Grampy Can Ya Hear Me“, the 5th episode of Season 29 and the 623rd episode to date. This Episode Fact File will recap the episodes with pictures, video clips and more. Get the scoop right after the jump! 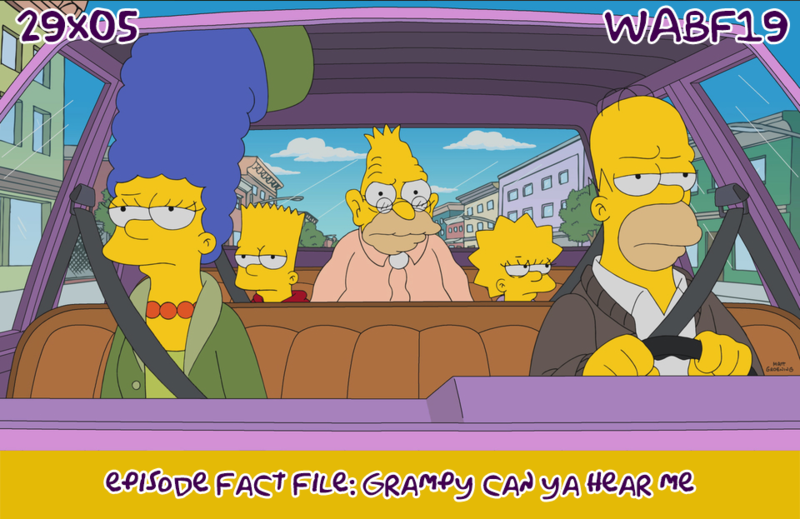 Episode Details: ‘Grampy Can Ya Hear Me’ is the 5th episode of Season 29 as well as the 623rd episode of The Simpsons. The episode aired on FOX on November 5th, 2017. It was written by Bill Odenkirk and directed by Bob Anderson. TITLE SCREEN! : The ghost of Tracey Ullman Homer is flying across the screen holding and strangling the ghost of Tracey Ullman Bart. The Simpsonovich family is peeling potatoes, when suddendly they grab the couch and escape, when soldiers storm in the house. 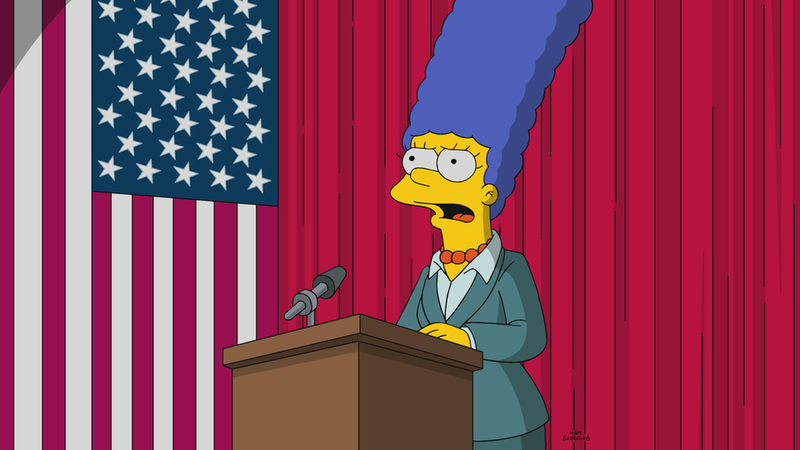 After traveling on a boat, they arrive in the U.S., where they’re granted access, renaming themself as Simpson. Moe arrives and grabs pieces of the name tags, renaming himself as Szyslak, but he is not granted entrance, and is instead quarantined. At their new home, Homer is sewing, Maggie is in a crib, Bart is playing with a baseball, Lisa is crocheting, and Marge is cleaning clothes and then hangs the couch to the clothesline. The scene changes to a bar where Marge and Homer are sitting on the couch while other people dance. Homer tries to put his arm on Marge but she moves away. At 742 Evergreen Terrace the family is sitting on the couch when they have to leave when the house is flooded. Springfield families find themself on a UFO, that flies away from Earth. The Simpson family arrives at the acceptance room, where a Riggelian attaches a Riggelian family name to their name, and Homer d’ohs. On Grampa‘s birthday the Simpson family arrives at the Springfield Planetarium. After buying the tickets, to which Homer shows the ticket stand girl how he was an astronaut, he tries to weight himself and is surprised to weight just 182 pounds, but Marge corrects him indicating its his weight on the moon, while Bart and Lisa watches as a reproduction of Pluto talks about how it lost his status as a planet in the solar system, and he’s taking revenge on the Halley’s Comet. At the Planetarium show, the family is watching a documentary on the big bang, but Grampa escapes after the explosion is shown. Returning him to the Springfield Retirement Castle, Grampa complains about the music being too low, due to his hearing problem. At the castle, his companions throws him a little party, asking him to make a wish. Old Jewish Man gives him a birthday gift, an hearing aid, a much appreciated gift as it gives him the hearing back he has lost long ago. Lisa goes to Bart’s room to ask him a favour, while he was returning from preparing a prank for Skinner with a snake, to change a homework paper she delivered with the wrong date for when the big bang happened. Bart and Lisa break into the school‘s basement, and change the date, but also discover that Skinner is living in the storage. Skinner tells the story of how his mother kept a big secret from him. As a kid, he applied to the Ohio State University, to become part of the marching band, however his mother lied about him being accepted. At home, Grampa hears the dislike of the family for him being there, and says he’s leaving the home forever and goes to Springfield Mall, where the shop attendants threats him like an old man too. That night, Lisa has a nightmare of the future, becoming president, however being disqualified for cheating on the paper, while Skinner dreams of becoming a drummer, and Grampa goes to the Veterans of Unpopular Wars bar, where he tells the bartender his problems. Skinner goes to the Ohio State University, where he tells them his story, but gets refused, as its too late, and gets called a loser, convincing him to discuss the matter with his mother. In class, Lisa confesses to Miss Hoover her trick, but she tells her she knew it, but she wants her nicotine gums that Bart stole, and its revealed he gave it to the class pet who darts across the room with his wheel, energized by them and goes to torment Willie. At Skinner’s house, Skinner tells his mother he knows what she did, but the anger goes away when she cries in front of him for what she did. He agrees to move back in to his conditions, though he has to live with Barney, who moved in his room. Grampa has still not been found, and Homer recieves a call from the bar, with the bartender sending Grampa back home and to not send him again there. Back at home, Grampa hears the family missing him, however they’re just reading a script written by Lisa and Marge, but Homer reveals it’s the episode’s script. At Skinner’s house, Skinner and Agnes share tv, happy together. At the end, Hans Moleman is the main character of a short, “Nobody knows Hans Moleman]], where he falls on a manhole, and is stand upon by Homer, and is trumped by Patty, and scanned by Shauna like he’s nobody, while he just needed his heart pills. The title of the episode is a reference to the Academy Award-nominated 1983 song “Papa, Can You Hear Me?“, performed by Barbra Streisand. Rick and Morty‘s Szechuan Sauce is held by Maggie in the opening. Agnes and Principal Skinner watch Game of Thrones at the end of the episode. At the Springfield Planetarium, a poster asking to “Bring back Futurama” is seen. During the planetarium show, “America the Beautiful” by Samuel A. Ward plays. In the car, “In the Mood” by Wingy Manone, Andy Razaf and Joe Garland plays. Jasper Beardly and old people sing “Happy Birthday to You” to Abe. When Grampa realises he can hear, “Ode to Joy” by Ludwig van Beethoven plays. The Chewbacco nicotine gum is a reference to Chewbacca from Star Wars. Brutus Buckeye, the mascot for Ohio State University, is seen. Skinner says “Et tu, Brutus?” when Brutus Buckeye makes an L sign on his forehead. Skinner also pushes Brutus Buckeye into a statue of Woody Hayes, who served as head football coach at Ohio State University from 1951–1978. Casket City‘s slogan, “Think inside the box”, is a pun on the expression “think outside the box“. The Russian soldiers invading the Simpson House is similar to the couch gag of “The Last Traction Hero“. 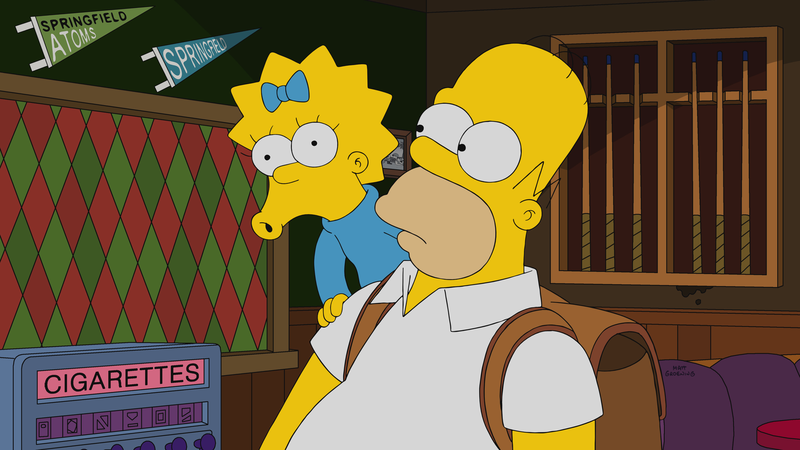 The Simpson family is reading a script, which is revealed to be the episode’s. TSTOTopix: Episode Fact File: Season 29 and 30: What We Know So Far! This pictures and videos are from the “Grampy Can Ya Hear Me” episode of FOX show The Simpsons. Their use is believed to qualify as fair use under United States copyright law.